It may be easy for architects to imagine real 3D spaces simply by looking at flat 2D designs, but for clients unused to the architectural process, it has always been tricky. Since the recent revolution in the BIM (Building Information Modelling) world, it’s now rare to design a building without using clever computer-generated 3D design. It enables clients to see how their building will look, even in the fairly early stages of the design process. With 3D modelling, Virtual Reality (VR) technology that allows you to ‘walk’ in your proposed space with the aid of a VR headset, and even the use of behind-the-scenes Artificial Intelligence (AI) systems which can analyse the spatial network of a site on many levels without setting foot in it, architectural technology has become a lot more sci fi. Now, we almost always draw in 3D. Walls are no longer a straight line on a 2D plan, they have 3-dimensional properties like height and relativity. We are literally building a building but digitally rather than in cardboard, plastic, or bricks and mortar. BIM software is used through the whole process of design, for warrants, construction drawings and tender packages to builders. This makes everything clearer for clients, as well as architect, engineers and builders, to see how spaces will work visually and technically. BIM is particularly effective when designing and building large residences or those with complex spatial relationships between other buildings. Having said that, the ideas still come from humans – you the client, and us the architects. 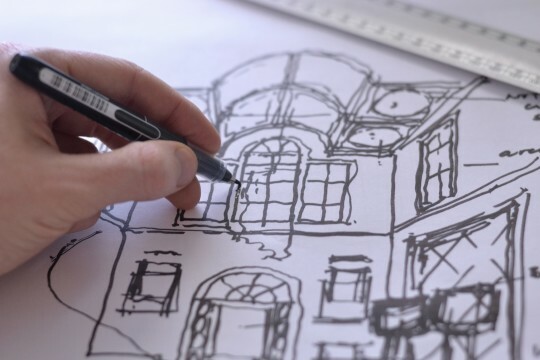 There’s no software yet to replicate a creative right-brained architect with a black felt pen, knowledge of the client’s vision, the environment, the style required, a passion for architecture and the ability to come up with an intelligent concept. With that in mind, we start every project with a group brainstorm and a selection of sketches. Likewise, we still need ideas boards, detailed discussions about what you like and don’t like, and careful consideration about how a building will sit in its environment. Once these things are decided, and initial sketch ideas chosen, we begin mapping on 3D models to help visualise how the building will look in reality. This 3D model grows as the design process goes along, adding details along the way. It’s also very useful for detailed interior architecture and design, showing everything from staircases, to cornicing, plus materials and furniture positions. We have a clearly defined process that includes BIM, so clients know what happens at each stage of the design process. We share this with you at the beginning. We offer various levels of digital model from basic to fully rendered and the option to experience the space in Virtual Reality. If clients still want a physical model we can produce this using a 3D printer. BIM software is a brilliant tool but building on software is a lot like building on the ground. It takes time. Although a kitchen designer may be able to mock up a kitchen on the computer in under an hour, designing a house accurately takes considerably longer. A kitchen designer may have 20 different fixed unit sizes to choose from, essentially moving boxes around a pre-set room. With houses, there are literally thousands of options. It’s definitely not just a click and go solution. Each element has to be accurately depicted in 3D, involving measurements and detailed architectural know-how about how materials work and join together. BIM adds a wonderful new dimension to the building process, allowing everyone to imagine a building before it’s built. But we still use old-school methods, too. Fiona Robinson recently had a client who struggled to understand the scale of the building he was commissioning. She literally took him around a selection of grand houses to show aspects such as the height of ceilings, the width of staircases, and the look of traditional cornicing and panelling. We can still do that – but we can now combine it with BIM technology. With BIM, difficult technical issues are highlighted early so solutions can be found prior to tendering the project out to builders. BIM is great for testing ideas, too. Options can be presented to clients when important decisions need to be made. Clients no longer need a great leap of faith to agree to new solutions. This gives clients confidence and a greater involvement in and understanding of the design process. 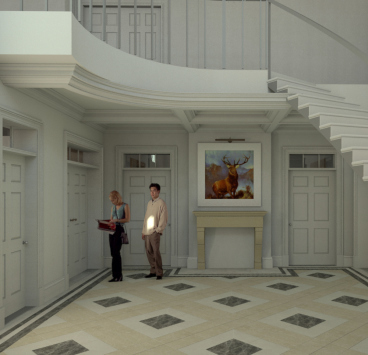 At one recent project meeting, our client had seen a building with a large entrance hall and wanted this exact size. 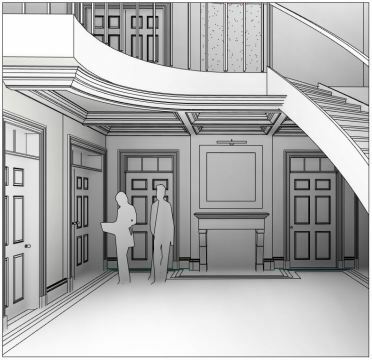 When he walked around our digital model using BIM software and VR glasses he realised he wanted an even larger hall and was very pleased to be realising this at the design stage when we could make the change with relatively little disruption to the process. We’re hoping that we won’t be seeing the rise of the AI architect robot anytime too soon. If you’ve got a project brewing,contact us, and let’s start the conversation.